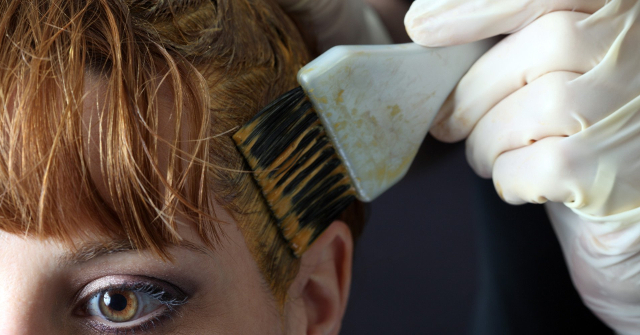 Allergic Reaction / Contact Dermatitis complaint would often come from an individual who has recently either had a colour carried out at the hairdressers or perhaps used a home colorant. This reaction may take effect as soon as the product touches the scalp, a few hours after or even the day after the colour. This can make the scalp feel hot, itchy, look red and become very sore. These feelings are produced by a degree of inflammation on your scalp caused by the product(s). In extreme cases this can even cause an anaphylactic reaction, however, this is rare. Most often contact dermatitis produces a mild reaction which presents like an eczema type of reaction to the scalp. It is essential that before you have a colour at a new salon or try a brand of colour at home that you carry out/request a patch test. This is when a small amount of the product is applied behind your ear and left for 24 hours with a plaster over to monitor for a reaction. In addition, a small strand of your hair should be tested to see how it reacts to your chosen colour. Hair loss after accidentally bleaching my hair at the salon. Can you help restoring my hair? Does colouring or tinting my hair cause hair loss? I totally understand how emotional conditions of the hair and scalp are. I am used to having patients call me initially on the phone in tears, I will personally reply to each and every inquiry. (by phone if requested). Read our Terms & Conditions for privacy and cancellation polity. Professional, extremely knowledgeable, caring, empathetic and EFFECTIVE! Yes, I cannot recommend Shuna and her team enough. 10 stars in fact! Initially I was really, REALLY nervous and doubtful that much could be done. I am so happy to be proved wrong!! If you're worried about hair loss or scalp issues, please call Shuna and her team. I sincerely recommend Sussex Trichology to anyone. Shuna was brilliant. Knowledgeable and sympathetic to the patient. One of my relative visited her recently and talked about her. Shuna has been such a great help with my hair and we have managed to reverse the hair loss. Shuna offered a sympathetic ear and has helped me not just physically but mentally too. A definite five stars! I can thoroughly recommend Shuna. She has been very professional, knowledgeable and understanding at a time of need. Really pleased with the great care and attention taken and would highly recommend. I had a good experience from my visits at Sussex Trichology. After two years of struggling with hair falling, I have found this trichologist. The treatments along with the special hair products are working well and I would recommend this place and their treatment plans to anyone losing their hair. Great staff and service, they made me feel reassured. For all the women who have thyroid issues or any other medical conditions and are experiencing hair loss, I recommend you set up an appointment with Shuna. Trust me you will start to feel better and start gaining your confidence back. I did and I feel I have gained my youthful looks back and I am excited about having my hair feeling back to normal.